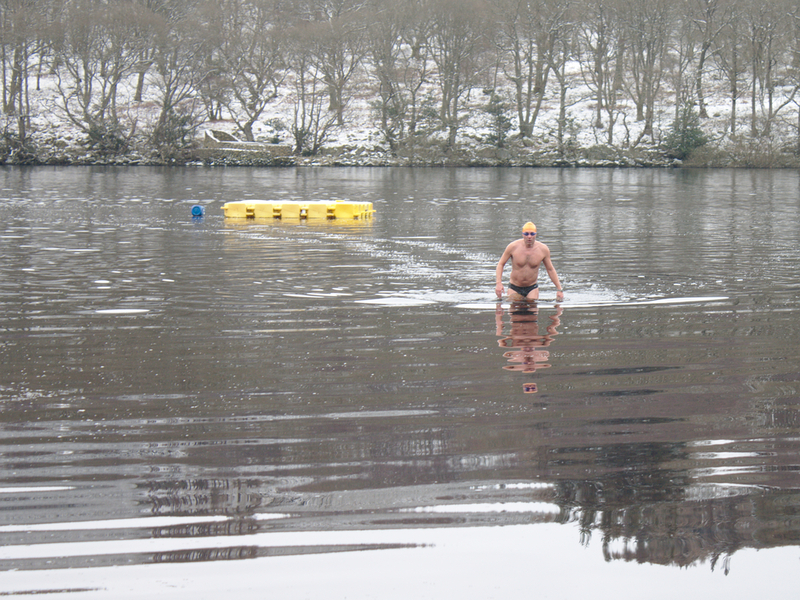 Late last week the opportunity to make another Official Ice Mile attempt was offered by Dublin and English Channel swimmers Fergal Somerville and John Daly, this time the attempt to be made in Lough Dan, up in the Wicklow Mountains. Since the previous attempt I had already turned down another opportunity the previous week in the Kerry Mountains, (a report of which I’ll have for you soon). I told Fergal I wouldn’t be able to make it, and that was still pretty much the case only 24 hours beforehand. However, after a night with four and half hours sleep, lying awake at five a.m., I decided I’d at least attend, and maybe consider it. And so it was that Dee and I left at seven a.m. for the estimated two-hour journey up. Passing Hollywood, (not quite like the better known, younger and more brash American version) we rose gradually up to the Wicklow Gap, and minus four degrees air temperatures with two inches of snow, staring down the long miles of the Wicklow Way to the dawn sun briefly breaking the clouds and shining on the distant Irish Sea. It was stunningly beautiful of course, and nerve-wracking to drive. 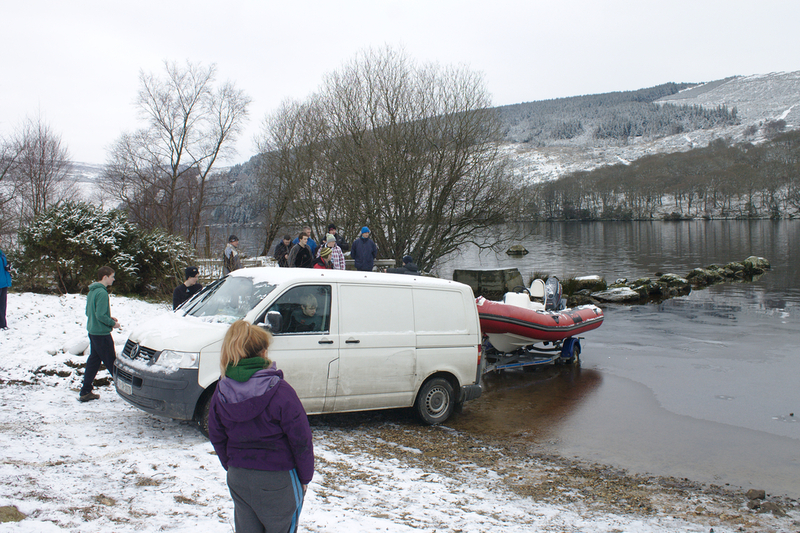 We were driving almost an hour from when we encountered the first snow and ice before we arrived at Lough Dan just before nine-thirty a.m.
Lough Dan is a Scout and hiking centre and site for overnight camping in the snow, so there were many people about and most of the swimmers and crew were already present. One swimmer from the previous attempt would not be with us, having decided to attempt it by himself, and instead Carmel Collins, a Sandycove swimmer, joined us. We moved the cars down as close to the lake edge as we could, about a hundred metres, and proceeded to check the temperatures. 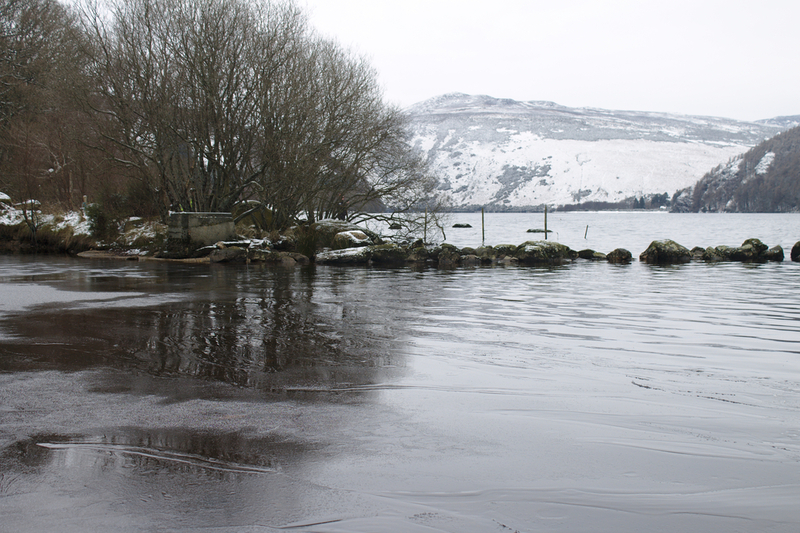 The tiny bay from where we had lake access was about only ten metres across, and half-covered in ice. So it was immediately obvious the temperature wasn’t too high this time around. And there was no wind, which is important. 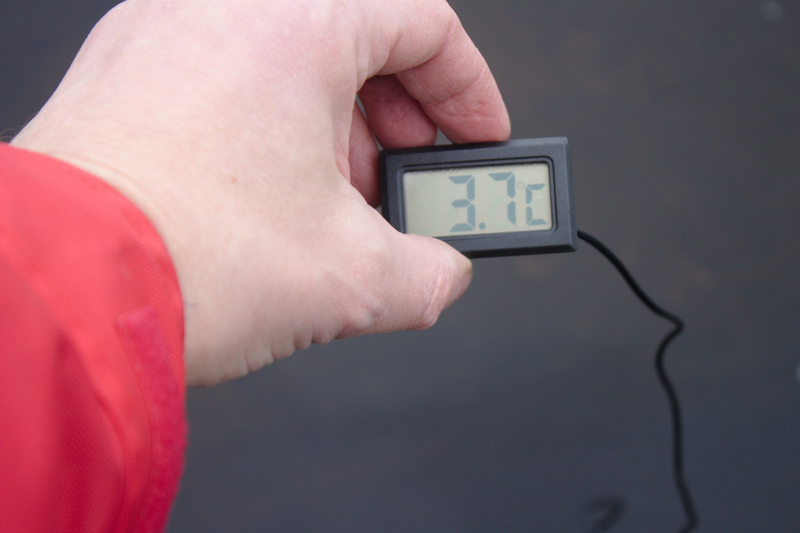 My first measurement in the shallow water indicated the horrifically low reading of 1.4 degrees Celsius. I moved out along the rocks delineating the east side of the cove to get to deeper water and took a long measurement which read 3.7 º C.
An Official ice Mile, as you probably know, requires water temperatures of 5 º Celsius or less, measured at three different locations, by temperature probes reading 30 centimetres below the surface. The swim course would be a 400 metre loop, beginning at a pontoon about 50 metres off the shore, and leading down into the lake and back, with four full loops required for the pre-requisite 1650 metres, with a little extra distance padding built-in for anyone swimming the full course. We had a RIB (rescue boat) and a kayaker, a doctor and plenty of other helpers. Irish English Channel record holder and paramedic, Mr Awesome, Tom Healy, and his partner Rachel were also on-hand for extra safety along with others including Vanessa Daws, artist, open water swimmer and video documentarian of the Irish open water swimming scene. (Note: I only met Tom for the first time in Dover when both he and Alan Clack were preparing to swim their respective solos on the same day). I met him and Rachel again the day afterwards, and I rubbed the tattoos on his arms. “No. they don’t come off” he said. “Actually“, I said, “I was checking if the awesome would rub off on me“). We had to wait a while longer than expected before we could start, (and why that is, is a story I hope to return to soon in a separate joint-authored post with Finbarr Hedderman). I thought about the swim, thought about how little sleep I’d had in the previous 48 hours, about how my weight is only one kilogram higher than it was for the previous attempt, thought about how the water was colder than I expected or hoped, (4.9 to 5.0 would have been my preferred but difficult to achieve temperature). I thought about the 40,000 metre training week I’d just completed, without expecting this as the end and even the fact that I hadn’t been in the sea for almost two weeks, my longest absence in a year. I thought about my distracted mental state. And I thought most importantly about whether I wanted to actually to attempt the full swim, and decided I didn’t. I realised I was not capable of it that day. So I decided I’d (almost) certainly only do a half-mile. After all, it would still be a decent swim, in water colder than I’d ever had an opportunity in which to swim. We had the safety briefing, and just after eleven a.m. Fergal, John, Patrick Corkery, Colm Breathnach, Carmel Collins and myself finally entered the peat-black water with Vanessa in her wetsuit and her trusty Go-Pro. I dislike slow entries, while I also don’t like to dive into cold water I don’t know. So wading out behind Fergal, I got my hands and face in for a good splash, let my breathing settle for a few seconds and then started swimming, while it was still shallow and everyone else started swimming virtually immediately. As you’d expect, water somewhere between three and four degrees really hurts. I hope you didn’t expect me to say something more profound. As with all cold water it hurts most in the hands, feet and sinuses. It just hurts more acutely and more quickly. I seem to have control over the sinus pain this year, (I’ve only noticed in retrospect) and each year I’ve noticed some improved aspect of my cold tolerance. This water didn’t cause any stabbing sinus or face pain. But my hands and feet were immediately painful and the pain didn’t abate. And I was almost unable to kick from the start, as kicking when your feet are painful with cold seems to increase the pain. By not kicking, the blood also flows more slowly in your body. It’s not really a conscious decision, just one of those possibly individual quirks of cold water for me, though it’s then more difficult in the reduced buoyancy of fresh water lake to maintain a horizontal streamlined position. Once past the left side of the tiny cove, I immediately went too far to the left, while most of the rest went too far right and we met at about 100 metres out half way to the buoy. Patrick, Fergal and I were together to the first turn, with the kayaker providing a watchful eye, with me inside on the turn. I came out of the inside turn somewhat at a disadvantage to Patrick, shall we say. I’m normally up for the full contact aspect of open water swimming, but this swim wasn’t one where I was so motivated. Patrick and I stayed together with Fergal in front pulling a few metres ahead. We touched the pontoon at 400 metres and turned back. Approaching the end of the third leg Patrick and I were still together and I was going to get caught between him and the buoy again, so I dropped back and swam over his legs to his right side to go wide around the turn, which allowed him to open up five metres. It wasn’t relevant, I was heading into my final 200 metres. Approaching the pontoon again, I somehow got a mouthful of water, in flat water! Which made me splutter, and further confirmed my decision that today wasn’t my day. I swung right, and into the cove. It was very difficult to walk over the stones of the hidden lake floor with my painful soles and Tom Mr Awesome Healy waded out to assist my landing, such as it was. Dee and Carmel’s partner Gordon helped me get dressed, and we moved back the car. I’d swum somewhat over 800 metres, I was in the water for 16 minutes. I wasn’t obviously as hypothermic as I’d been after the previous attempt, in fact I was able to kind-of-jog back to the car. Twelve minutes or so later Colm finished first, as always, followed by Fergal, Patrick, Carmel and John. Since we were back at the car however, we don’t have photos of the rest finishing. It was a fantastic achievement for them all, and all deserve Congratulations: Fergal Colm, John, Patrick and Carmel. 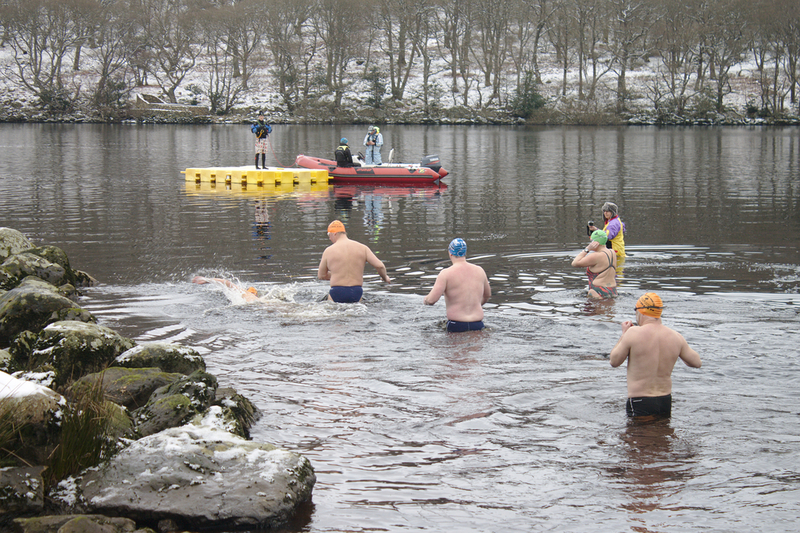 There were different levels of post-swim hypothermia but that is to be expected of course. The safety cover and assistance and help were excellent, top class in fact, with no worries about anyone. I recovered in about 40 minutes, unlike the much longer recovery of the previous attempt. Safety decisions are best made OUTSIDE the water. I’d left myself the small possibility of attempting the full swim but I knew before I started that it wasn’t likely. My weight hasn’t changed much, I’m still lighter than in three years at least, but most importantly, I knew I was unwilling to dig into the mental reserves I knew I’d have to access in order to complete. I know how to find and access those mental reserves for swims but it would come at a physical price. And I also know that sometimes that pushing myself too far isn’t the wisest thing to do. The full mile would have been too far for me. 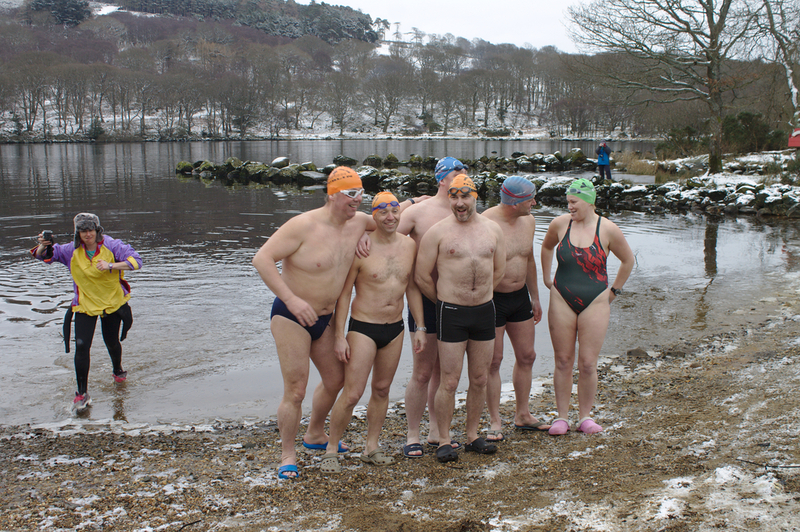 It was a fantastic achievement for the five swimmers, as it is for all ice mile swimmers. By exiting to plan, I didn’t encounter, or cause, any of the safety issues that we’ve seen or heard about on a couple of recent ice-mile attempts in various location. I also had a fantastic experience by reaffirming to myself that I am capable of entirely making my own safety decisions for myself, regardless of what anyone else is doing and as such the day was an enormous success for me also. You sometimes hear marathon swimmers say they swim to find their limits, and this was one of those times for me. I am very happy with the exploration. Check out Fergal’s report on his blog. 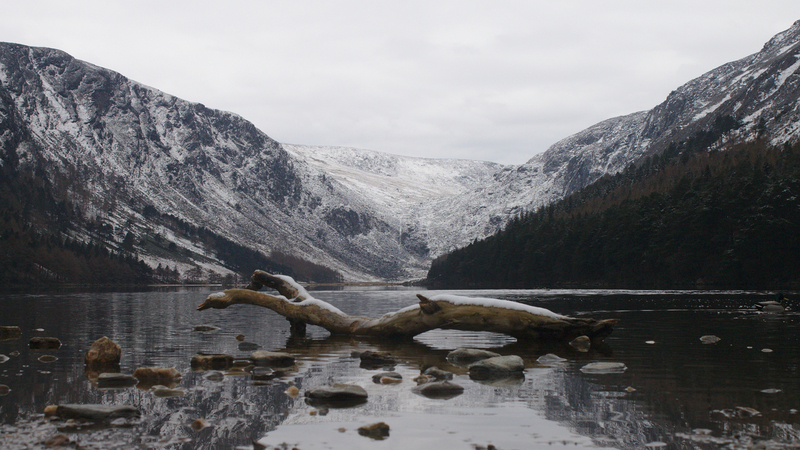 (On the way home we stopped in beautiful Glendalough, where it almost seemed someone had helpfully placed a single washed-up log, ideal as a photographic focal point!). I sometimes agree. That day was certainly one of them. One for my fellow wild swimmers. I just love this blog! Mini adventures, available to all! Great write up Donal. Ice swimming is not to be taken lightly. My Grandmother, who came over on the boat), used to say that Ireland was a great place to be on a sunny day if you had money in your pocket. Not very high, nothing is, Carauntouhill, the highest mountain in the county is only about 1000 metres. 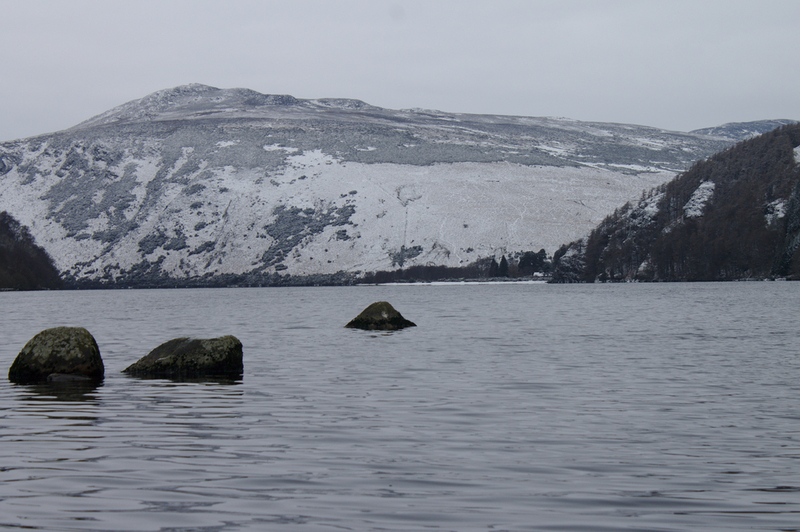 Lough Dan is 200 metres (600 ft?) 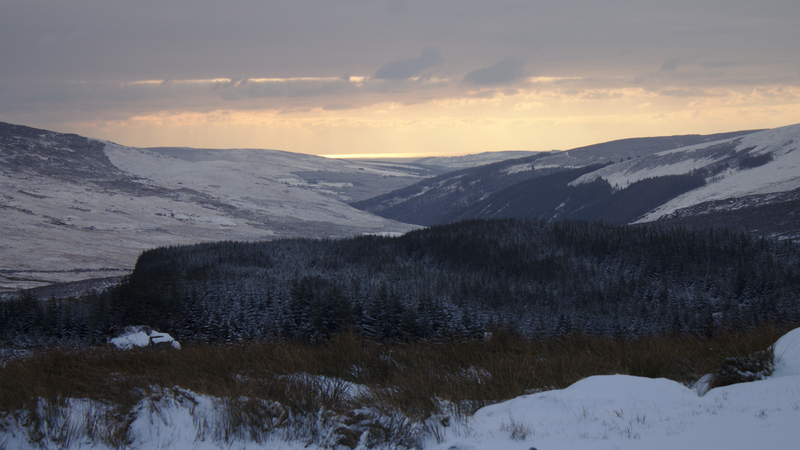 high, but the Wicklow Mountains do get a bit more snow than elsewhere. The rest of the country on the way home was snow and ice free. Well done, Donal, both on your swim and knowing when to call it a day. I’ve never managed more than 400 m in that temperature. Great photographs, as always! Congratulations to the Ice Swimmers, and congratulations to you on making the smart decision for yourself. Your explanation of the process is so valuable. The right day for you will come. Stunning pics, btw. Evan, totally agree… lots of respect for Donal’s decision. Thanks for the reminder “Safety decisions are best made OUTSIDE the water.” …so true. Cheers Wayne, I think it’s incumbent upon us to explain that not every swim can be a success, and the related factors thereof. I’m quite unhappy with some recent safety decisions I know about, and I’m worried that mindless pursuit of the ice-mile by some (luckily none the swimmers in this group) seems to be destined to end in tragedy somewhere along the line.